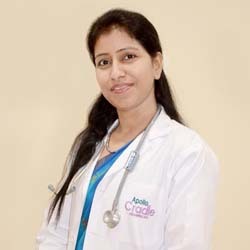 Dr. Monika Maheshwary is a gynaecologist & obstetrician practicing in Apollo Cradle, Amritsar. She worked as an assistant Professor in sri Guru Ramdas Institute of Medical Sciences, Amritsar and worked as consultant in Sukh Sagar Hospital, Laparoscopy Centre, Amritsar. She specializes in infertility cases, gynaecological surgeries (open, NDVH- stitchless, Laparoscopy) menopausal problem & also medical management of Gynae problems. She believes in constantly keeping herself abreast with latest development in the field of obstetrics & gynaecology. Dr. Monika had delivered my baby. I was very anxious as I came to know that I was supposed to undergo the procedure. She had supported me emotionally and strengthened me by her positive words. I did not have any post-surgical complications. All the nurses took better care of me and I thank Apollo Cradle for the constant care. I am very impressed by the level of expertise exhibited by the staff of Apollo Cradle. Dr Monika and the staff took care of each and every need of ours. It was a tough time for us, but Apollo Cradle helped us through it. We will always remember this amazing experience. I would wholeheartedly recommend Apollo Cradle to everyone. Thank you, Dr Monika and the team of Apollo for saving our daughter’s life. Dr Monika is warm, intelligent and highly experienced. She made me feel at ease to ask anything and was reassuring. I will forever be thankful to her and I couldn’t have done it without you. I had a very good experience here at the Apollo Cradle during the birth of my baby under the care of Dr Monika, and have no qualms giving it 10/10 rating. Everything from hygiene in rooms, housekeeping staff, to food served, the administration has been just superb.